Glitches are unintended effects that can be found in the Grand Theft Auto series. Glitches are bugs or exploits within a game. Find some water, preferably a small pond, but not the ocean and walk towards the water. Continue walking when you hit the water and you'll continue walking/swimming, but only for 5-6 seconds. One is method of reaching Shoreside Vale early on in the game is by exploiting a glitch that allows you to walk above the Porter Tunnel. To do this one must drive a Bobcat to the concrete sea wall above the tunnel entrance. The player has to reverse the car half off the wall above the middle of the tunnel. The player then exits the vehicle, falling into Blue Hell, landing above the tunnel. They can then walk along the tunnel, then jump into Blue Hell at the Shoreside Vale end, so that they can get teleported above the surface. This glitch can be performed at the subway in Shoreside Vale at the airport. When the train arrives to the platform, take the very last door of the train. Enter the train and then get out again. You will automatically get teleported above the platform, into the Blue Hell and you will see the tunnel. Word of caution, sometimes the tunnel will get invisible and you risk walking off the edges and get teleported back to the streets. This glitch can only be performed with an Infernus at Francis International Airport. At one end of the runway pointing towards the ocean, there is an elevated helipad near where a Dodo occasionally spawns. On the side of the helipad pointing towards the ocean, there are two staircases, one smaller than the other. Back up the Infernus onto the staircase, where it will get stuck. Then get out and the Infernus will make a reverse sound constantly increasing in pitch. If done correctly, it should eventually come unstuck and drive away at high speeds. Pressing the jump button in front of the car will show an animation of the player jumping out of the path of a moving vehicle, because the game thinks the Infernus is moving. To perform this glitch, the player first must be in a taxi. Then, while holding down the 'activate side-mission' button, the player can get in any vehicle and then release the button to activate the mission. The side-mission can be played normally. This glitch has apparently been fixed on the iOS and Android versions of the game as the side-mission button disappears when the player exits the vehicle. This glitch takes some skill and practice, and it only works if cheats are used. First, jack any car normally, and before the player closes the door, activate the "Blow up Cars" cheat, and the car will explode. Before it explodes again, activate the health cheat and it will be able to be driven. It will tilt to the side due to missing wheels, but the speed won't be affected, however the steering will. The missing wheels can be fixed by going to a Pay 'N' Spray. Storing the vehicle in a garage will restore it to its normal state. In the multi-story car park in Staunton Island, jumping on the top of a car on the south side of the roof and then jumping off, facing the rest of the car park will cause the cars there to disappear. If you spawn a Rhino (using the cheat code) anywhere in the city, a second one will spawn in the middle of the street at Liberty Campus around the corner from the Safehouse. This glitch can only be performed if you have exported all of the emergency vehicles at Portland Harbor. Once you can export them, choose one and find a truck or large vehicle (like the Yankee that spawns nearby). Park the truck underneath the vehicle about to be lowered, and the crane magnet should move away if done correctly. Then move the truck away and the vehicle should be stuck in midair. The only way to get it down is to shoot at it until it explodes or shoot at it with a rocket. To trigger this glitch, the player must have a one-star wanted level and be chased by a police officer while running to a vehicle that will be stolen. Steal the vehicle, and hope that the officer pulls out his pistol to arrest the player. Quickly pause the game and enter the "Destroy all cars" cheat (preferably many times). All vehicles will explode, and the officer will be killed, but Claude will become indestructible against everything except being caught in an exploding vehicle. Claude's health and armor, if any, can still be replenished back to 100%. This glitch is useful for surviving high wanted levels or gang attacks on foot. This glitch wears off when the player either starts a mission (not a vehicle side mission, such as Paramedic), enters an interior, is busted, or caught in an exploding vehicle. In the original PlayStation 2 version of the game, after achieving 100% completion, if the player obtains a Detonator either through a bomb shop or using a Detonator Grenade, the Detonator weapon will not disappear after using it. Ways to remove the Detonator include having the player be wasted or busted, or have the player walk through metal detectors at Leaf Links or Escobar International Airport. This glitch has been fixed in subsequent versions by having the Detonator weapon slot excluded in the infinite ammo perk. It is possible to morph the player character onto a motorcycle. First the player has to park a motorcycle next to a clothes pickup, just to the left of the pickup so that when the player exits the bike, the character won't change clothes. When the player gets back on the motorcycle, the screen should fade while the character is seated on the bike. If done successfully, the character should be in a standing position while stuck to the motorcycle. The player will never fall off the bike unless they voluntarily exit the bike. This glitch can also be done on cars. To do this glitch, first fly a Maverick into the Spray 'n' Go at Sunshine Autos. Once the door closes, the helicopter should have wheels connected to the skids. Once this glitch is performed, the helicopter cannot be flown anymore, and it must be pushed out of the garage. The same can be performed with a Skimmer, except it can take off land now. This glitch is only present on the original PlayStation 2 version. The initial scores of both Trial By Dirt and Test Track will have the same time results once both scores are listed in stats. Once you play the missions again and beat each time, the scores will be individual as they should be. To do this, you must have the "large tires" cheat. Activate it, and then save any car. Next load the saved game again, activate the cheat again, and so on. The wheels should get abnormally large, affecting the handling of the vehicle. If the vehicle is too high you cannot get inside. Get a car, and drive off of a jump. In mid-air, press the vehicle enter/exit button, and the car will suddenly freeze floating in the air, with Tommy standing on the roof. However, on rare occasions, the car may disappear immediately when the button is pressed, and Tommy will fall to the ground. A rare glitch involves the rooflight on taxi vehicles (Taxi, Cabbie, Kaufman Cabs) being missing. Traffic taxi vehicles can spawn a rare but legitimate variant of a "lightless" taxi. A trick to obtain a lightless taxi more easily is to first fill up the Sunshine Autos garages to the brim with cars. Run across all the garages, having all four doors open, then run towards the street. By chance, if a taxi does spawn, it could be spawned without a rooflight. It is claimed that the Cherry Popper Ice Cream Factory save point can corrupt the player's saved file. However, there is no evidence supporting this claim. To avoid possible corruptions of the files, save elsewhere. While flying in a helicopter, when performing a drive-by in the cinematic camera view (and the only way to perform a drive-by while in a helicopter), the sound the gun makes is not the sound of a submachine gun but the sound of a pursuit Police Maverick's machine gun. This has been fixed on the mobile versions of the game, as there is no way to perform a drive-by in a helicopter. Obtain a Monster and park one wheel onto a random car (sideways or front on, both work). Get out of the Monster, get in the car you park on, and you may find yourself spinning 5000+ ft in the air, crashing back down to earth. After completing the mission End of the Line, all law enforcement vehicles will, for some unknown reason, disappear from the player's garage (police cars, Rhinos, and even the SWAT Tank), making it very difficult to keep the SWAT Tank that only appears on that mission. If you ram into a bike with a driver, and then quickly drive away, whilst looking back the ped disappears, and the bike will drive with no one on it. This happens if you are far enough away that the ped disappears whislt they are doing the 'get on' animation. The bike reads that the driver is getting on, and drives like normal, but the ped is gone. The bike will drive like normal until it has been flipped over or jacked. Carl Johnson will not punch anyone off if he tries to steal it. In the original PS2 version only, pressing square and then tapping X repeatedly will cause the 3D model of the player to deform substantially. Most times this only works on uphill inclines. A glitch allows the player riding as a passenger in a car in co-op mode to use any weapon in a drive-by. First, the player that will ride as a passenger will have to waste all of their SMG ammo. Then they will have to switch to their weapon of choice and get into the car. Then, entering in any weapon cheat will allow the player to use whatever weapon was in the current slot. (If the player has a pistol, and uses the cheat that gives them the Desert Eagle, they will be using the Desert Eagle, not the pistol) You cannot drive-by with melee, projectiles, heavy weapons, of sniper rifles. On the southernmost block of Fort Carson, there is a Beagle that spawns in the driveway of a house. It is a glitch because it spawns between the house and a tall palm tree, with its left wing submerged in the side of the house. It is unstable, as even the slightest nudge or push can cause its left engine to catch on fire and explode. Entering it is not recommended, as it will also lead to imminent destruction and certain death. Sometimes it just explodes as soon as you get close enough for it to spawn. This glitch is most likely a coding error. Maybe a different vehicle was meant to spawn there, but the Beagle was placed there by accident. It is possible to get it out by sprinting against its backside and nudging it out from between the house and the tree, or by using several cheats. You can open the front gate of the Easter Bay Airport before you have acquired a pilot's license. Walk up to its left sliding gate, punch it, and then turn around quickly, and it will open. There is a common and sometimes irritating random factor of the game where airplanes crash to the ground or into buildings near CJ (with sometimes fatal or mission-failing consequences). Most crashes occur if the player is roaming around an area with many tall structures around him (buildings, trees, etc). The airplane may crash into one of these structures, making an audible explosion sound. However, there are also some instances where the player is on relatively flat ground and an airplane may just crash straight into the ground near him, or into the vehicle the player is in. Other crashes occur after CJ exits an interior after being inside for a few minutes and an aircraft spawns too low. This could be due to the unadvanced artificial intelligence that flying airplanes have in-game: when they spawn, they are programmed to fly in a straight line above the player, occasionally flying straight into a tall structure. Airplanes aren't necessarily programmed to change direction to avoid an oncoming object, they just rely on path files. Another explanation could be that the game developers implemented this on purpose, to emulate the random plane crashes that happen in real life. Random crashes occur all around the state, most notably around Downtown Los Santos and San Fierro, or also in heavily-forested areas like Whetstone. There are also frequent crashes atop Mount Chiliad. In Area 69, SAM sites are known to shoot down even NPC airplanes (except Police Mavericks and Hydras), which will eventually crash down to the ground and may explode near the player. Any bike in GTA San Andreas will burst into flames if it somehow ends up resting upside down. This is probably a designer oversight, because the task of getting a bike upside down is almost impossible. To perform this glitch, first steal a vehicle near the car crusher. Make sure the driver follows you. If it is timed right, get out of the vehicle so the driver will get in just as it is lifted by the crusher. The car will disappear or spawn nearby and drive away, and will either be non-solid and eventually fall through the map, become severely distorted, or both. Steal a bike from an NPC, and make sure its radio is on. Immediately after you steal it, press and hold the accelerate button, and there will be no sound coming from the bike, even though it is accelerating. You will only be able to hear the radio. Stop the bike to an idle, and the engine will be audible. Drive a VCPD Wintergreen to the stadium and buy access to the Phil Collins Concert and exit or watch the concert. When you come out, there is a 3/4 chance the bike will be squashed. You can still mount the bike but it will revert to normal if you manage to. Try to play a difficult side mission (best examples are Vigilante and Paramedic) and turn off your PSP, then turn on again until at some time it will freeze and your PSP will restart. Have a 2-star wanted level or more, then fly a little low in an area where the cops are chasing you. The police will take you off the helicopter even though you're flying. Sometimes if a battle with the Bikers occurs in Grand Theft Auto: Vice City Stories, shoot the Angel with an Assault Rifle while the driver is driving fast, and it will show the Angel doing the donuts with no driver. On very rare occasions, a glitch will occur while attacking an enemy gang building that will turn all the gang members into Victor Vance's character model (see here for example). The gang of Vics will still talk like enemy gangsters but will have much more health. The game will then crash shortly afterwards. After a missions ends in which an enemy was shot or blown into water (such as the missions Tunnel of Death or Uncle Vlad), the body of that particular enemy will not be shown in the water, even if the cut-scene ended with the player only a few feet away from the sea. If the player falls into a gap (i.e. between two cars or between a car and a dumpster), Niko Bellic will suffer minimal damage even when falling from a height that will normally kill him. At the beginning of a date with any Girlfriends while in any vehicle, wait for her to get tired and fire a weapon to end the date. The vehicle the player is currently in will become damage-proof. In the subway tunnels, it is possible to be forced through the wall and into Blue Hell. 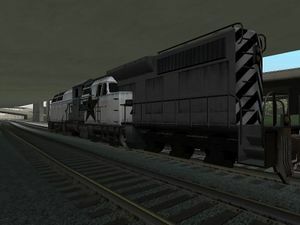 If the player is riding a motorbike and is trapped between the wall and a moving train, he can be forced through and off the bike. The player could also use a large vehicle (such as the Bus) and get shoved by two subways going in opposite directions to get forced into Blue Hell. All that occurs is falling for a brief few seconds before respawning on the ground above. In the online multiplayer mode "Bomb Da Base II" players have reported a bug/glitch, that occurs at a certain point in the mission. The screen will go black and then start loading, the player will be loaded back to single player. In Francis International Airport in the online multiplayer mode "Free Mode", if the player drives a truck up one of the ramps in the Airport it is possible to make the truck fall on its side and start spinning in circles, this is not only visible to the player, but also other players. If the player gets out of a vehicle parked on the entrance gates leading to Francis International Airport's cargo yard (with stop signs on them,) the gates will go back down and cause the vehicle to disappear. If a vehicle's engine doesn't start, it will start if someone calls the player on the cellphone,or, more conveniently, if the player calls someone else. On multiplayer mode, if a vehicle's engine doesn't start, it will restart by kicking the front of the vehicle. Sometimes when driving by the gas station in Westdyke, there are two vehicles parked in the parking lot, one of which could be parked with it's engine running, doors locked, and the hazard lights on, which cannot be turned off by the player. When trying to open or get on top of a moving vehicle that is driving down a slope if Niko misses the vehicles door and it drives away Niko will sometimes start walking weird and won't stop until he hits another object. This glitch has been dubbed 'Retarded Niko' by the way he looks and walks when in the glitch. A player can lose a 5 or 6 star wanted level by flying their chopper over Francis International Airport. The wanted level will revert to a 4 star. Sometimes the protagonist is stuck in a loop when trying to buy some food at Burger Shot - he then just stands in front of the vender doing nothing. The only way to get out of this loop, is to reload the game. This is also true with any of the Hotdog stands, with the only difference, that the player walks in a circle all the time. If you are lucky and wait long enough, the animation might stop and the protagonist gets the food at last. If you spawn a car using cheats while looking over the edge of an overpass, the car may float in the air. If you shoot it, it won't become damaged, but it will fall down. Alternatively, if you spawn one while standing just before the entrance of the Booth Tunnel, the car may become stuck in the top of the tunnel. Again, shoot it to get it down. Occasionally a 'rock car' spawns in the game (sometimes in multiplayer). This vehicle looks like any normal NPC while in motion until hit, however the vehicle does not move from its line of travel, creating tremendous forces against both vehicles, leaving little cushion since the reaction is close of driving the vehicle directly into a wall. The impact usually kills the NPC and creates high to extreme damage to the player's car. (Damage to engine, suspension, etc.) Damage may be lessened on the NPC's car, but not as much. Other possiblities besides vehicle damage is ejection of player through windscreen and NPC's vehicle combusting internally. On the Xbox 360 version, if you kick somebody using the X button while they are using a computer in TW@, their health will be completely drained or almost drained. This usually doesn't work if the NPC is sitting at a chair with no computer. Only possible in TBoGT: When in a car, boat, or on a motorcycle, and equipped with either an SMG or Micro-SMG, switch the drive-by weapon to the SMG. Activate the "Advanced Weapons" cheat, and your SMG will be replaced with an Assault SMG, which can't normally be used in drive-by mode. When firing the Assault SMG, Luis's body will become extremely deformed due to there not being a proper animation for firing this weapon from a vehicle. If you reverse while looking at the front of your car, then stop reversing while staying in the same camera view, the hood (or bumper, in the Banshee's case) lights up while you reverse, as if it were a reverse light. There is a glitch that happens with cars that have tiny door sills. If the car hits a curb when one door sill hits the curb or when turning hard enough so that one of the door sills hits the ground, the door(s) on the specific side will fly off. This works best with the PMP 600. If Niko jumps on top of a vehicle, and the vehicle drives either up or down on an incline, Niko will flinch and fall over. However, on rare occasions, Niko may even be catapulted a few feet in the air. This also works in TBoGT and TLaD. Sometimes, after finishing the second mission for Sara, the package you picked up will be in your hand, along with your weapon. You can change weapons normally but you cannot shoot, and aiming is glitched. This can be fixed if the player dies or gets arrested. If you drive a car up against any shop or safehouse door so that it opens, if you get out of the car, the door may sometimes start to vibrate and distort. This page was last modified on 24 June 2015, at 21:46.